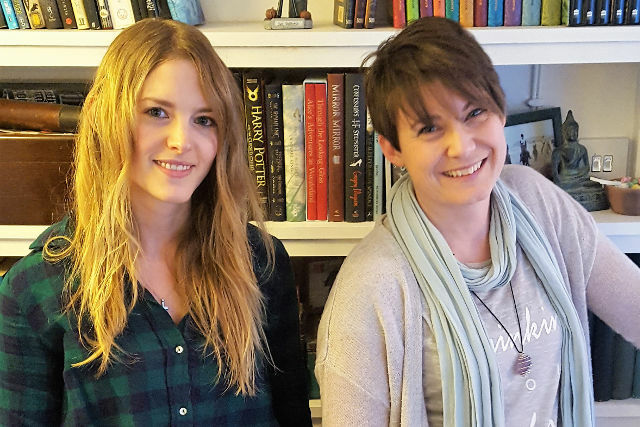 A new writing group has been founded in West Wight to help other budding writers. The first meeting takes place early next month. Writing, whether short stories or a full-length novel, can be a lonely and difficult business. Writers block, plot holes, misbehaving characters are just some of the struggles that every budding author will face. And then there’s the complex issue of getting your work published. Do you self-publish? Start a blog or try the traditional route and get an agent first? It was a dilemma facing two friends in Freshwater, who decided the time was right to combine their skills and experience and create a group to help other budding writers. “I’ve wanted to be a writer since I was about ten years old. I remember in middle school we were given an assignment to write about an old castle in the middle of the forest. I think most of the other children wrote a side of A4. Mine was six chapters long! But like many aspiring novelists, life got in the way. Having a child, going through a marriage break-up, a battle with depression and an anxiety disorder, meant that writing took a back seat for many years. But things are now looking brighter for Krissy. “Mentally I’m feeling in a really good place now, thanks to the support of some amazing friends. Last year I took part in the Three Peaks Challenge for the West Wight Sports and Community Centre. “It was the most difficult thing I have ever done, but it was a life changing experience. Knowing that I had the inner strength to climb Ben Nevis, taking it just one step at a time, completely changed my outlook. I’d put off my dreams for too long, so when I got back I picked up my notebook and started writing again. “The idea for the West Wight Writers group came out of conversations with my friend Zoe Sadler. Zoe is a wonderful children’s book illustrator. She has been featured in several books, and in 2015 self-published her first picture book ‘The Lighthouse Keeper – A Cautionary Tale’ by doing a crowdfunding campaign. She is also due to appear at this year’s Isle of Wight Literary Festival. “Zoe has a background in publishing, having worked as a book designer and illustrator for a small London publisher. However, like me, she was frustrated at how difficult it is not just to get published through the traditional route, but getting your book noticed and creating sales. Between them, Zoe and Krissy have a lot of knowledge to share. Like Zoe, Krissy has experience of publishing through working as an assistant to a London literary agent. Having started out as a reporter for Isle of Wight Radio, a wide variety of careers followed and Krissy’s expertise now lies in PR and marketing. “The popularity of social media means that any author has direct access to their readers and can do their own marketing without the need to pay a PR company to do it for them. However, I have come across so many writers who just don’t know where to begin with it. Once the idea of starting the group was formed, the next challenge was to find a venue. And there was only one choice ‘The Rabbit Hole’ – the delightful tea shop and children’s book section of ‘Mrs Middleton’s Bookshop’ in Freshwater. With the posters designed and the flyers printer, Krissy and Zoe are now busy spreading the word. The first meeting is being held on Thursday 2nd March at 7pm. It’s free but tea, coffee and cakes can be purchased from the tea shop. For more information, you can also contact Krissy at krissylloyd@gmail.com or by phone 07900 538440.